alaTest has collected and analyzed 35 reviews of Krups XP 200040 Expert Combi. The average rating for this product is 3.0/5, compared to an average rating of 4.4/5 for other products in the same category for all reviews. People are impressed by the size and design. The reliability and price also get good comments. Opinions are divided on the durability, while many are critical about the performance and noise. We analyzed user and expert ratings, product age and more factors. Compared to other products in the same category the Krups XP 200040 Expert Combi is awarded an overall alaScore™ of 75/100 = Good quality. Solid build quality. Ability to make espresso, cappuccino and filter coffee. Easy to use. Removal water container for espresso making. Espresso hot water sometimes doesn't flow - get a build up of pressure. Noise level and vibration - not excessive but noiser than expected. Easy to use, makes lovely coffee, build quality is good. Thought it was very loud,has small water chamber, it was very good but had to be returned as the filter holder was faulty and so was the lock that locks the holder to the machine, it leaked water. Terrible frothing performance. Flimsy Filter Coffee jug. Makes flat cappuchinos. After my last coffee machine I spent a lot of time checking out coffee makers. 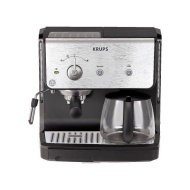 I had it narrowed it down to two systems and this Krups was one of the two. My wife, tired of my procrastination & indecision bought the Krups for me for Christmas.